Summer and swimming go together like dog tongues and ice cream cones, but if there’s a puppy at the pool party, water safety needs to be a top priority. 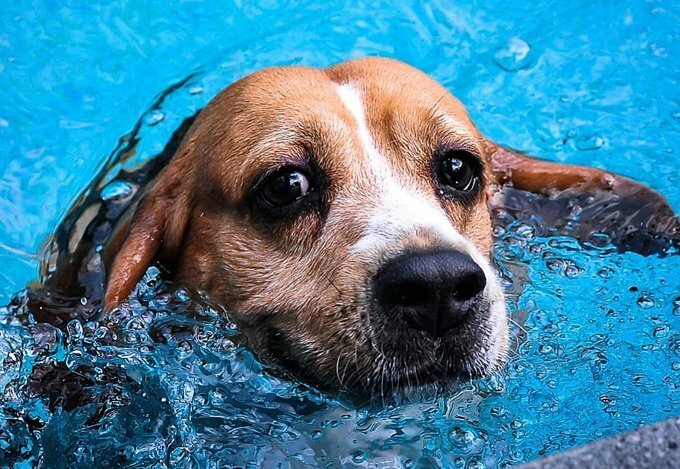 According to a study of drowning incidents in small animals, swimming pools are the most common man-made location for pet drowning incidents. Many new dog owners underestimate the danger a backyard pool presents and overestimate their new puppy’s swimming proficiency. 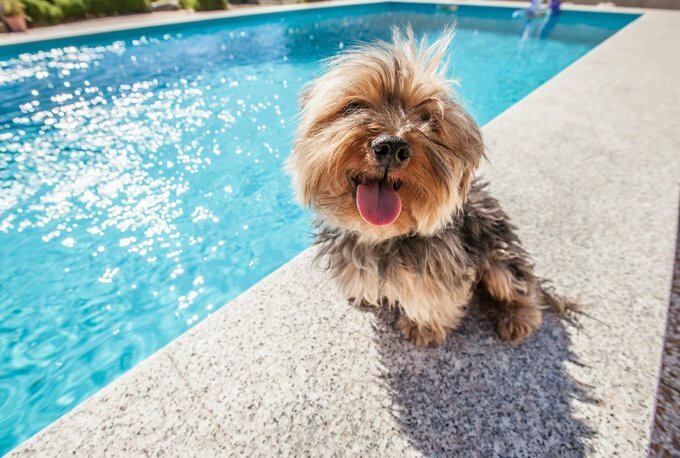 Contrary to popular belief, puppies are not always born knowing how to swim, so if you’re planning on bringing your pup poolside this summer, keep these safety tips in mind. If you’ve got a baby dog in the house, you’ve got to baby proof the pool. Experts suggest barriers — such as pool fences and baby gates — may prevent an unsupervised pup from slipping into the pool when there is no human lifeguard on duty. The fence you choose will depend on your pool, your pup and your budget. Renters may want to consider a temporary, mesh-style fence, while those who plan on living by the pool long-term can invest in permanent barriers made of aluminum, wood or vinyl. 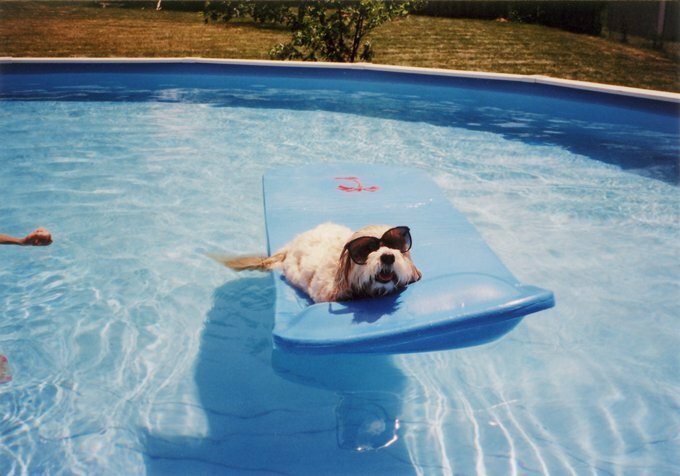 Any pool and spa supply store can help you find a puppy-proof barrier to suit your lifestyle and outdoor decor. 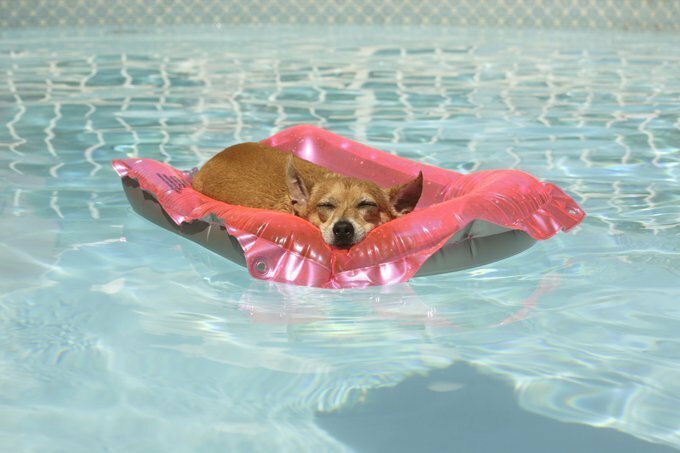 A pool fence can keep your pup safely on dry land, but the sad fact is, puppies can drown even in a pool full of people. Sometimes, people incorrectly assume a puppy is having fun when they are really drowning. Very young puppies don’t have the strength required to swim to safety or climb out of a pool when they need to. That’s why a puppy’s first swimming lesson should be the one that teaches him how to find the pool exit. suggest placing a landmark — like a big plant or a flag — beside the pool stairs so the pup can always find them. A pup’s first swimming lesson should see a human gently carry the puppy into the pool and guide them out of it, with plenty of tasty treats and praise for the pup when he climbs out. Many professional dog trainers will do home visits to help you introduce your puppy to the pool in a positive way. According to the AKC, all dogs should wear a life jacket while learning how to swim — even if they’ve got the water-loving genes of a Retriever. 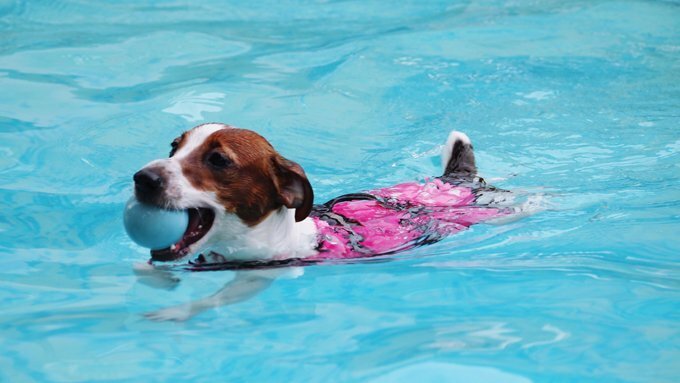 Pet life jackets have become more and more popular in recent years, so you should be able to find one to fit your dog’s body type without much trouble. The best ones have some additional material under the dog’s chest or tummy to give them a boost of buoyancy. 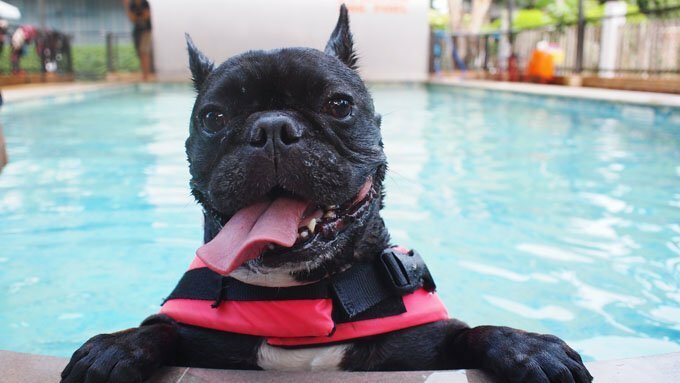 Life jackets are a great purchase even for pups who don’t have a pool in their own backyard, as they can easily be brought along if your dog gets invited to a pool party at someone else’s place. Sometimes, a pup likes his swimming lessons so much he finds a way to get through the gate and into the pool without his people or his life jacket. In these cases, pool alarms can be a literal life saver. There are a bunch of different ones on the market, and some states actually require them by law. Buoy-type alarms will sound when something disturbs the surface of the water. The downside to these is you may end up rushing outside to rescue your neighbor’s far-flung football thinking it is your pup. Other types of alarms feature sensor technology you attach to your dog’s collar, so you can be sure it’s actually your pet activating the alarm. If all else fails and your dog does end up at the bottom of the pool, knowing canine CPR could save your puppy’s life. Researchers suggest education about canine CPR could reduce the number of pool-related fatalities — and it could be helpful in a number of other situations as well. Check if there are any pet first aid classes in your area, or ask your trainer for a recommendation. A day in the first aid classroom might not be as fun as a day at the pool, but it will ensure you and your puppy can enjoy the water for years to come.